Danger danger! High Voltage! Now first and foremost this is a title that deserves your respect, and that’s not just because it has a title and a theme that is something you’d associate with danger, no, Danger! 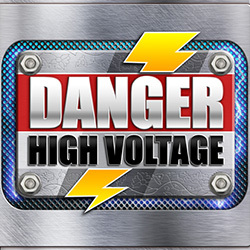 High Voltage deserves your respect on just how fun it is to play. We look at a lot of different slots and trust us, there’s a lot of games that go for the wackiest titles ever only to fall flat when you actually begin to play them for yourself. Developers Big Time Gaming have perfected their craft and this is yet another example in how they go about creating a sense of mystique and intrigue in how they advertise and create these experiences over time. The ever growing reach of this Australian game company spans far and wide, offering unforgettable experiences crafted by hand. This has of-course attracted some rather big names to the fold including a range of rather well known customers including: Leo Vegas, Betfair, Sky Vegas and William Hill — all names that are synonymous with quality. They say there’s an online slot out there for everyone and the odds of it being a Big Time Gaming title is very likely. Look out for these guys, they just so happen to be a force to be reckoned with. Be sure to play this title with all the lights off, it’s not that this game is scary by any stretch of the imagination, but the colours you’ll see bouncing off the screen, you’ll see colours you never knew existed which is a feat within itself surely. How many other titles can say that? That they’ve invented a colour for you to behold? We could have basically said that and that only for this description but we thought we’d be nice and give you a little extra (aren't we generous!). It’s like we’ve already stated: there’s beauty in destruction and Danger! High Voltage has that in spades.